Named after Athena, the goddess of war, Athens is the well-known capital of Greece, made even more famous in recent years by protests and riots sparked by unpopular measures to manage the Greek economic crisis. 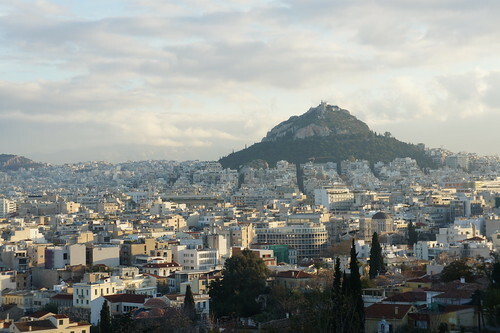 For many tourists, Athens is the base from which they launch their day trips. 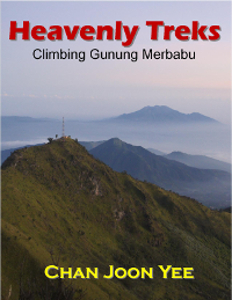 For contrarian travellers like us, it was more of an entry and exit point. Even though I would balk at the opinion that not seeing the Acropolis is like not having gone to Greece, it would still be an insult not to check out some of Athens’ landmarks. But the sights in Athens are nowhere comparable to those in Meteora and Mt Olympus. It is not even as inspiring as Thessaloniki. The only real attraction for me in Athens, is the Acropolis. 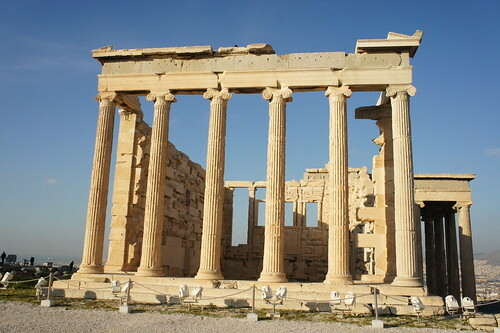 Meaning “high city”, the Acropolis is a sacred piece of real estate where the Parthenon is situated. 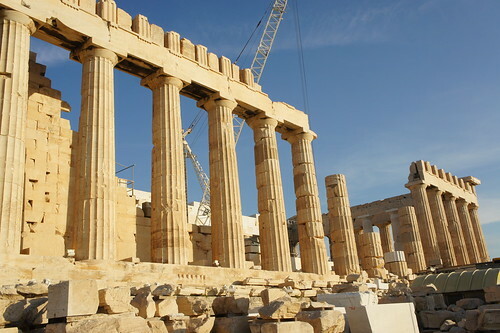 In its heyday, the Parthenon housed a huge marble chamber supported by massive columns. 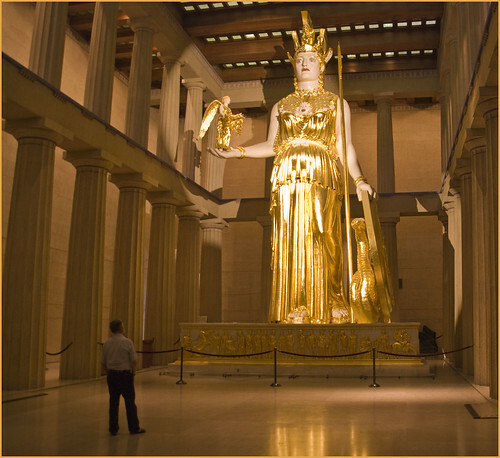 Inside, was a gold and marble statue of the goddess Athena. Built today, the construction cost would be half a billion dollars. Being a structure that outshone that of all their other Greek rivals, the ancient Athenians must have expected the Parthenon to last forever. To a certain extent, their wish has come true. While we see Athens as only a city in Greece today, it should be noted that it used to be an independent community called a “polis” or city state. Not long after the defeat of the Persian army at Plataea and the retreat of the Spartans back to their homeland in 479 BC, Athens began to build up the most powerful navy in the region. They then sought protection fees from neighbouring city states. The Delian League comprising 150-173 states was thus formed with Athens as leader and protector. But as time went by and when no threat was felt from the Persians, these city states started to drop out from the league and refused to pay tribute. In response to their disobedience, Athens exerted its military might to intimidate them, turning them into vassal states. Some semblance of an Athenian empire comprising mostly reluctant states was thus formed. Sparta was the only comparable rival in the region, but things were pretty peaceful as the Athenian Assembly was then led by a pro-Spartan statesman by the name of Cimon. When an earthquake struck Sparta, killing thousands and the Helots (Spartan underclass) rebelled, the Athenian army, led by Cimon, rushed to the aid of the Spartans after receiving pleas for help. The Spartans changed their minds and forced the Athenians to retreat with a virtual slap on the face. This humiliation resulted in Cimon being ousted and exiled by the angry Athenians. Cimon’s strongest opponent, Pericles, became his successor. Pericles was a very different man and his leadership meant that Athens would no longer be Spartan-friendly. 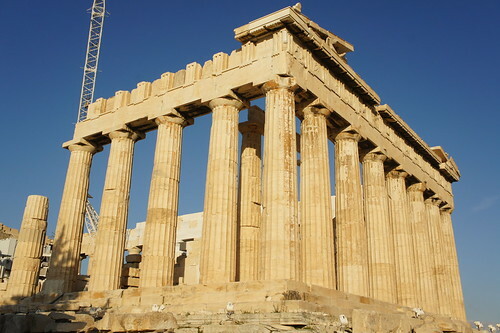 Construction of the Parthenon began in 447 BC when the Athenian Empire was at the peak of its power. 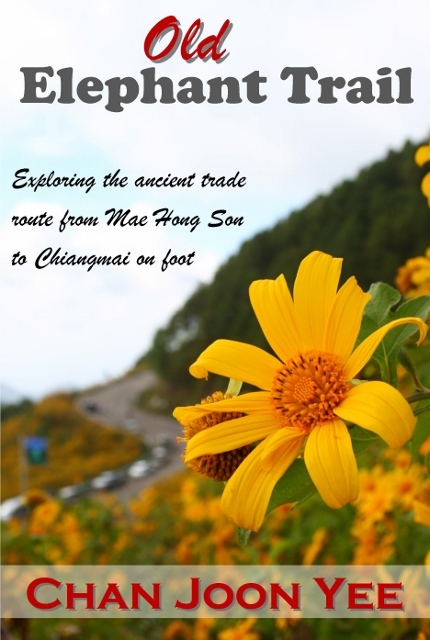 The city then had a population in excess of 60,000. The main structure of the Parthenon was completed in 438 BC but it took another 6 years to decorate the temple with sculptures and murals. 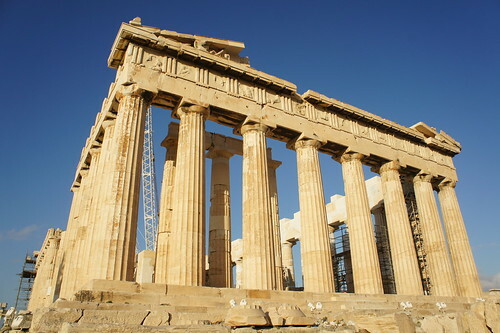 Today, the Parthenon is regarded as the most important surviving building of Classical Greece, generally considered the zenith of the Doric order (one of the three orders of architecture in Ancient Greece). Its decorative sculptures are considered some of the high points of Greek art. 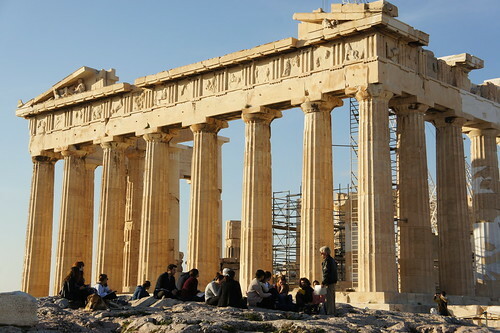 The Parthenon is regarded as an enduring symbol of Ancient Greece, Athenian democracy and western civilization and one of the world’s greatest cultural monuments in the world. Not content with just restoring, the Greek Ministry of Culture is currently carrying out a program of selective reconstruction to ensure the stability of the ruins. The Parthenon as we know it, actually replaced an older temple of Athena that was destroyed in the Persian invasion of 480 BC. While it was a sacred building dedicated to the city’s patron goddess, the Parthenon also served the practical purpose of a treasury. For a time, it served as the treasury of the Delian League, which later became the Athenian Empire. The extravagance of Athens was greeted by the frugal Spartans with suspicion and disgust. Boths Athens and Sparta grew until they became a convincing threat to each other. 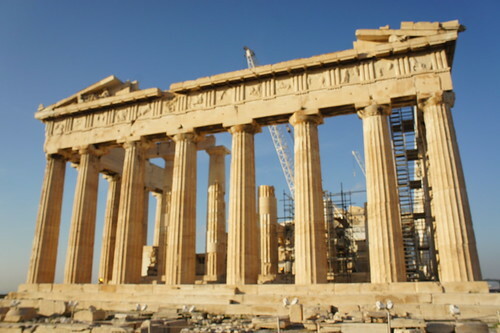 The Spartans invaded Athens in 446 BC, just as the opulent Parthenon was being constructed. Reluctant to go to war, the Athenians offered a truce. Or so it seemed. After the Spartan army retreated, the Athenian army and navy went beyond the borders of their empire, occupying smaller city states next to Sparta. The writing was on the wall. But the Spartans chose to dig in. The sheer size of the Athenian navy was intimidating. Their wealth and a well-developed monetary system had helped the Athenians grow into an economic power that allowed it to develop financially, militarily and artistically. The Spartans had no financial system. It’s army was powerful but tiny in comparison. In 432 BC, members of the Peloponnesian League (of which Sparta was the leader) sounded the alarm and wanted Sparta to do something. It was decided that as long as Athens pretended to be peaceful while it closed in on the League, negotiation was not possible. The aggressor was in denial. Led by Spartan forces, the Peloponnesians amassed a force of 60,000 and marched into Attica – Athens’ hinterland. The size of the allied forces surprised Pericles. As the army approached, he ordered the entire countryside to be evacuated. He then squeezed everyone into the city of Athens, sheltered behind its high walls to which the Spartan army had no answer. The port of Piraeus served as the trapped Athenians’ sole resupply route, taking advantage of the fact that the Spartans did not have much of a navy. The Athenians could hold out indefinitely this way, or so they thought. Unable to get the Athenians out from their fortress and being no match for them at sea, the Spartans gave up and left. But as fate would have it, the Spartan’s attempted invasion was not totally to no avail. Athens was only capable of holding 100,000 inhabitants. With the rest of the state squeezed into the fortified city, the population swelled to over 300,000. The sewage system was unable to cope. The worst that could happen happened. Athens was hit by a terrible plague. One third of the population was wiped out and Pericles himself died in the epidemic. Athens was devastated by the plague long after it had passed. New leaders who took over from Pericles started waging random battles all over the region. The empire started to break up. Athens became much poorer and many Athenians refused to accept a change in lifestyle. The city was close to bankruptcy and there was no way that it could afford to fight another war. Peace was restored when the Athenian army captured 120 Spartans and held them hostage. The Spartans then signed a peace treaty. It seemed like good news for the citizens of Sparta and Athens, but their allies were worried. States under Athenian rule didn’t want to support the Athenian’s lavish lifestyle and expected Sparta to liberate them. The signing of the peace treaty meant that Athens would still have a grip on them. 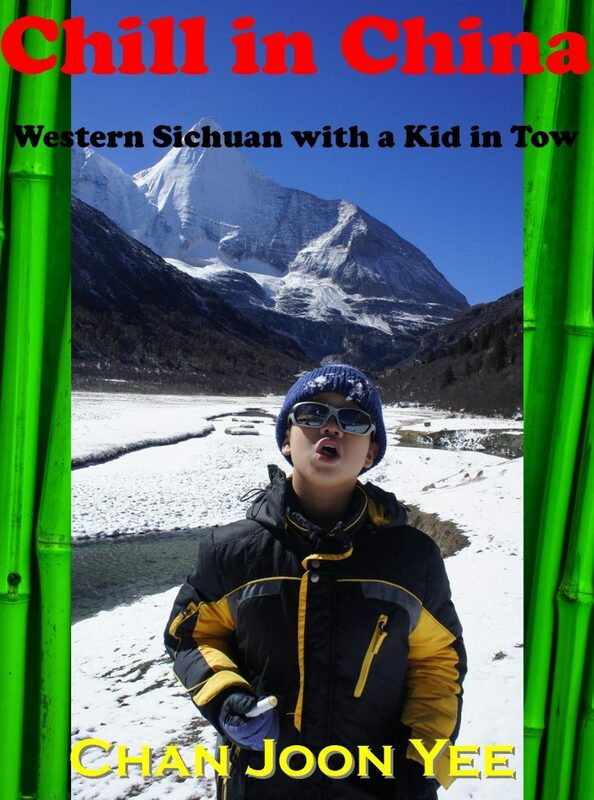 Then, a colourful character entered the scene and he would start another storm. His name was Alcibiades. Raised by the late Pericles, he was talented, well-educated and a great orator. Ambitious and aggressive, he was keen on attacking Sparta and tried to find some way around the peace treaty by forming alliances with Sparta’s neighbours. The Spartans saw through the sneaky move and fought fiercely over control of Mantinea in 418 BC. The Athenians lost. Alcibiades survived and over the next couple of years, set out to launch a full scale attack on Syracuse, an ally of Sparta on the island of Sicily 800 miles away! General Nicias was opposed to the idea. 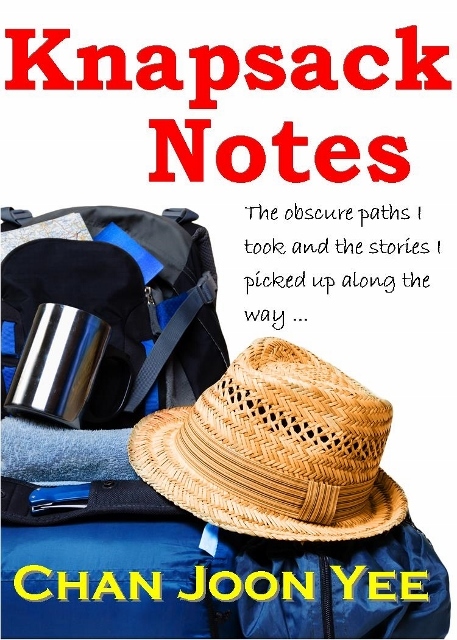 He felt that they had to settle their domestic problems before setting off on another war. But Alcibiades’ fiery rhetoric won the day. Nicias was outvoted in Athens’ democratic system. The Athenian armada set sail in 415 BC. Meanwhile, statues of the god Hermes all over the city were vandalised. Witnesses blamed Alcibiades, but he had already left on his mission to Syracuse, leaving the council to try him in absentia. The court in Athens found Alcibiades guilty of sacrilege and called him back to face punishment. Alcibiades was indignant. He knew that even with all his wit, he could not have defended himself. So he did the unthinkable – he defected to Sparta! The Spartans welcomed the high ranking defector and Alcibiades, being the chameleon that he was, was able to blend in completely with the Spartan way of life. Once the most loved Athenian, he quickly became the most loved Spartan. Meanwhile, Nicias became the reluctant commander of Athens’ formidable fleet. The Athenian troops managed to overrun Syracuse and turn its many buildings into ruins. Syracuse fell under Athens control. The Spartans didn’t want to get involved, but speaking on the Spartan side now, Alcibiades persuaded them to reinforce their allies and liberate Syracuse from Athens. The Spartans arrived in Syracuse to find the defending troops in complete disarray. The seasoned Spartans quickly trained and organised them and within a year, Syracuse launched a counter-offensive against the occupying Athenians. The reluctant commander Nicias was killed and Athenian troops suffered a humiliating defeat. Alcibiades had a first taste of revenge but he wanted more. He wanted to destroy his former home – Athens. Goaded by Alcibiades, the Spartans tightened the noose around Athens by building up a garrison just outside Athens, blocking its land routes once again, but this time, it was different. With most of its navy and ships destroyed in the battle at Syracuse, Athens was barely able to survive on supplies delivered by sea. Meanwhile, Sparta built up its navy and put it under the command of Admiral Lysander. They finally introduced a monetary system and colluded with Persia. Unable to get any real support from Persia, Sparta also wooed city states in the Athenian Empire. Thebes and Corinth saw this alliance as an opportunity to be liberated from Athens. The newly strengthened Spartan navy blocked the Athenian harbour at Piraeus and starved the people. They then attacked Athens continuously. Thanks to Alcibiades, Athens would fall to the Spartans in 404 BC. The Peloponnesian war was over with Spartan victory – or so it seemed. One would expect all Athenians to be slaughtered or enslaved, but Sparta did not do that. Instead, they allowed Athenians self-rule, albeit under a Spartan system of oligarchy. A council called the 30 Tyrants overlooked every move of the Athenian government. That would be a big mistake. Given virtually unlimited authority, the 30 Tyrants went on a rampage, killing and torturing all who were suspected of plotting a rebellion. 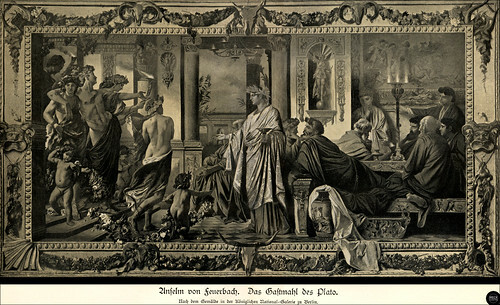 The hedonistic lifestyle of the Athenians was regarded as decadent by the Spartans. They expected every city under them to practise their system of austerity, laconism, social engineering and class distinction. Spartan society was divided into 3 classes – the elite warrior class, the independent craftsmen and farmers and lastly, the Helots or slaves who tilled the land. Victorious Sparta extended its influence on the Athenian Empire, imposing their values and system on them. It has been reported that a basic Spartan dish is a black broth made from pigs’ legs and blood seasoned with salt and vinegar. Spartan austerity, inflexibility, the Draconian system and probably their cuisine as well, did not appeal to the rest of Greece. Under Sparta, nobody could question authority or exercise his creativity. Art was deemed frivolous and there was no place in Spartan society for the weak. Just one year after Athens fell in 403 BC, the Athenians started a rebellion and the 30 Tyrants were vanquished. The states of Thebes and Corinth also embarked on the path of rebellion, put off by Sparta’s air of superiority and totalitarianism. In 371 BC, the Spartan army was defeated in Leuctra by the allied forces. Then, helped by Thebes, the Helots broke free from their Spartan masters and founded a new state, Messene, pushing the Spartans further back. For many generations, Sparta had enslaved the Helots and depended on them to provide agricultural produce while their own men joined the army. The independence of the Helots dealt a huge blow to Sparta’s ability to be self sufficient. Meanwhile, Sparta’s process of weeding out the weak and setting rules for procreation caused the population to dwindle. Detecting weakness, Thebes invaded. In 362 BC, the Theban army met the Spartans at Mantinea. To the surprise of everyone, the Spartans did not learn from their mistakes and used the same tactics that lost them the battle at Leuctra earlier. Not surprisingly, they lost the battle again and retreated to a tiny corner of their island, becoming a living museum, never to exert its influence on the Peloponnesia again. Athens and Thebes regained some of their former glory after the fall of Sparta, but they were later absorbed into Alexander the Great’s empire, then the Roman Empire. With the rise of Christianity, the Greek gods became theological fossils. 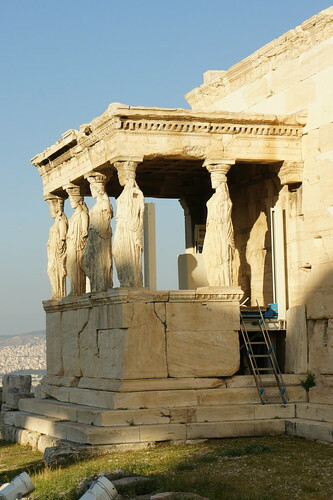 In the final decade of the 6th century AD, the Parthenon was converted into a Christian pilgrimage site dedicated to the Virgin Mary. After the Ottoman conquest, it was turned into a mosque in the early 1460s. On 26 September 1687, an Ottoman ammunition dump inside the building was ignited by Venetian bombardment. 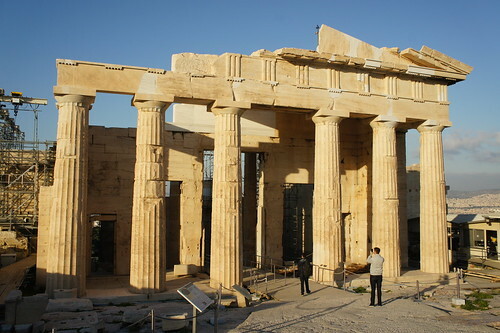 The resulting explosion severely damaged the Parthenon and its sculptures. From 1800 to 1803, Thomas Bruce, 7th Earl of Elgin removed some of the surviving sculptures with the alleged permission of the Ottoman Empire. These sculptures, now known as the Elgin Marbles or the Parthenon Marbles, were sold in 1816 to the British Museum in London, where they are now displayed. Negotiations are underway, but who knows when the British will return them? When the Greeks regained independence in 1832, the mosque was quickly demolished. Today’s Acropolis stands proudly against the Athenian skyline in both day and night. There is no question as to which city state represents ancient Greece best. The apparent opulence and hedonism of the Athenians left their descendants with something they can be proud of. 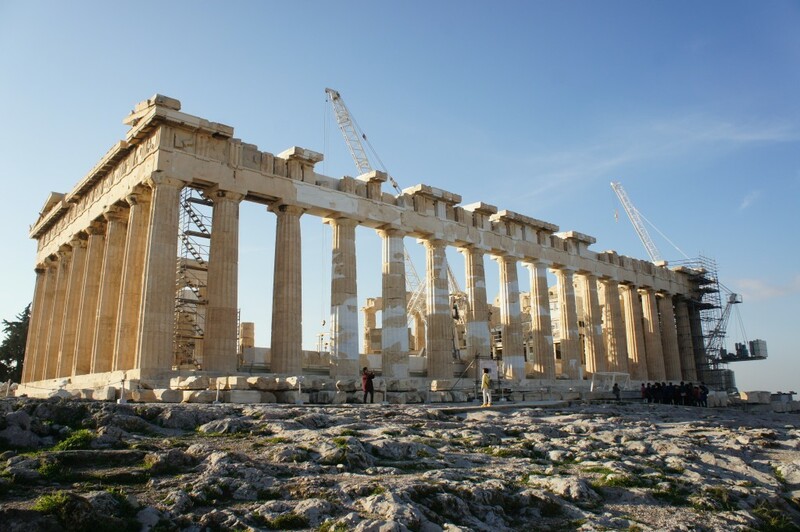 Restoring the Parthenon is a symbolic attempt to restore their former glory. On the other hand, the pragmatic Spartans did not build any great structures. Nor were they famous for teachers, artists and philosophers. 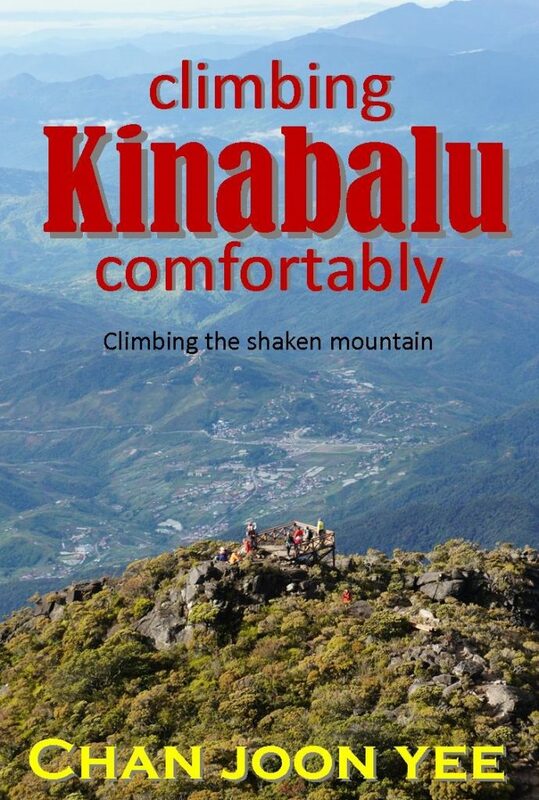 Their buildings were purely functional as they did not fuss with aesthetics. Hence, there is no equivalent of the Acropolis or the Parthenon in Sparta. Though they were once as powerful as Athens, their glorious military achievements had not been captured in any concrete form even though their system has been studied and adopted by the likes of Napoleon and Hitler. In contrast, the art, the culture and even the messy Democracy of the Athenians exude charm and elegance. They have survived and are being admired till this day. 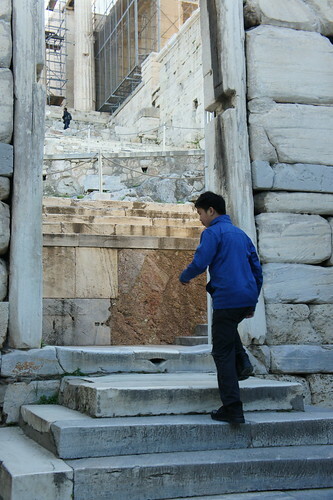 As I strolled among the magnificent ruins on this hill on that cold, sunny winter morning with my little guy, I could imagine the ideals which the Athenians held so close to their hearts. I can also understand how socialism and indiscriminate spending could take root in this society and how imposing austerity measures can incite violent protests and passionate graffiti. While those of us who are doing well at the moment lecture the Greeks on what they should or should not do, we should also realise that their current predicament is just one moment in history.